My main specialisation is the study of active galactic nuclei and quasars, and especially the clues from their variability and their spectral energy distributions. I have also worked on other extragalactic topics such as starburst galaxies and the measurement of large scale structure. I have often used very large scale surveys, and most recently was the PI of UKIDSS, and have been using PanSTARRS to look for extreme transients. My interest in large scale surveys also led me to work on the concept of the Virtual Observatory. My undergraduate degree (Astrophysics) was in Edinburgh, followed by a PhD in X-ray Astronomy at the University of Leicester. I held research positions at MIT, the Royal Greenwich Observatory, and what was then Queen Mary and Westfield College in London. My first Lectureship was also at QMW. 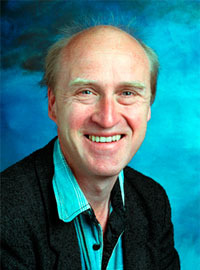 I was appointed as the Regius Professor of Astronomy at the University of Edinburgh in 1994, a position I still hold. I work at the beautiful Royal Observatory Edinburgh, a historic site shared between the University's Institute for Astronomy and STFC's UK Astronomy Technology Centre. I am a Visiting Scientist at the Kavli Institute for Astrophysics and Cosmology (KIPAC), Stanford University. I have taught at all levels from large first year general courses (eg Discovering Astronomy, Physics 1A) through Junior Honours (eg Astrophysics 3, Fourier Analysis and Statistics) to BSc Honour Courses (eg Astronomical Statistics and Measurement). I have published a textbook on Astronomical Measurement and have others in preparation. I am keen on innovative teaching techniques, and co-led an Astronomy Technology based MOOC with Coursera. In this video Andy describes his research which looks for dormant black holes in the centres of galaxies that temporarily flare back into life when a star passes close by and gets shredded.